Melt 1 stick butter in deep dish. Pour above mixture over butter–do not stir. Pour # 29-oz. can of sliced peaches. Bake at 325 deg. oven for 50 minutes. A cupcake flavored with nutmeg. The fried history of an export we re-imported. Do you drain the peaches? My understanding is that the syrup is an important element to the cobbler and you use the entire contents of the can! I used to make this years ago, and I believe the recipe came from a firemen’s cookbook. Happy to find this recipe. Thans. What size baking dish ? Made this recipe,very good! Easy to make! Yummy!!! Wow! This is a hit! Way out of the park. Also works great with mixed berries. Ever use fresh peaches in place of canned? Noticed a comment made also ,to use , not drain the syrup from can. If using fresh, does the fruit make enough of their own juices comparable to canned? 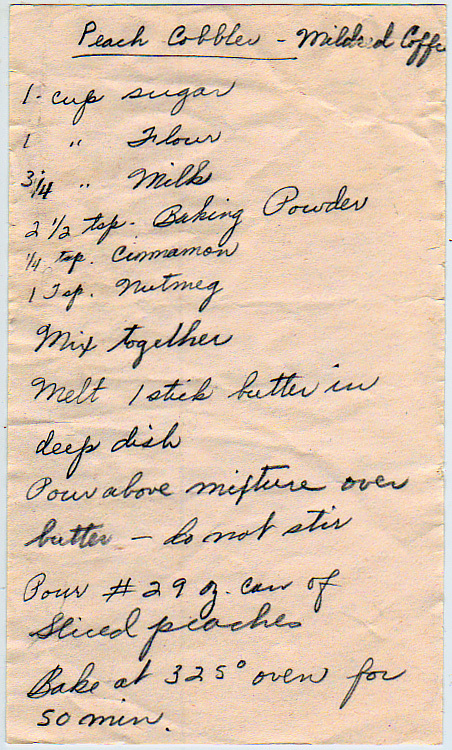 I had this recipe handwritten on a scrap of paper from a co-workers grannie years ago. So nice to see another written out recipe from the past. Tried and True!